The legion of Game of Thrones fans eyeing the return of fan-favorite Jon Snow next season saw HBO executive Michael Lombardo rain on their parade yet again, echoing the sentiments of the show’s producers when he addressed the Television Critics Association summer press tour earlier this week. “Dead is dead is dead. He be dead. Yes. Everything I’ve seen, heard and read, he is dead,” Lombardo told reporters according to the Wrap. Curiously, his “dead is dead” statement was almost word-for-word what show runner Dan Weiss also told Entertainment Weekly earlier this summer when asked about Jon Snow’s fate. “Dead is dead,” Weiss said when asked point-blank if Snow is firmly gone. Weiss, of course, went more in detail than Lombardo. That being said, Lombardo’s comments seem to be towing the company line more so than anything else. And in this age of secrecy by filmmakers, it’s possible that this is all a red herring to steer fans away from questioning Jon Snow’s fate on Game of Thrones so that if (or when) he returns, the impact will resonate that much more. Take former Star Trek and current Star Wars director J.J. Abrams for example. His methods of “mystery-box” directing are well known throughout the industry. “In the months leading up to [Star Trek: Into The Darkness’s] May release, Abrams teased out and danced around the identity of his villain, ‘John Harrison’, discussing the character’s agenda and intentions without actually spilling the beans on his true name and back story,” according to Screen Rant. The villain in question was eventually revealed to be the great Khan of Star Trek lore. Clearly Abrams didn’t want to spoil that moment for fans by spilling the beans too early. And according to Empire Online, J.J. is at it again, having kept details of the new Star Wars: The Force Awakens cast and plot under wraps as long as possible. 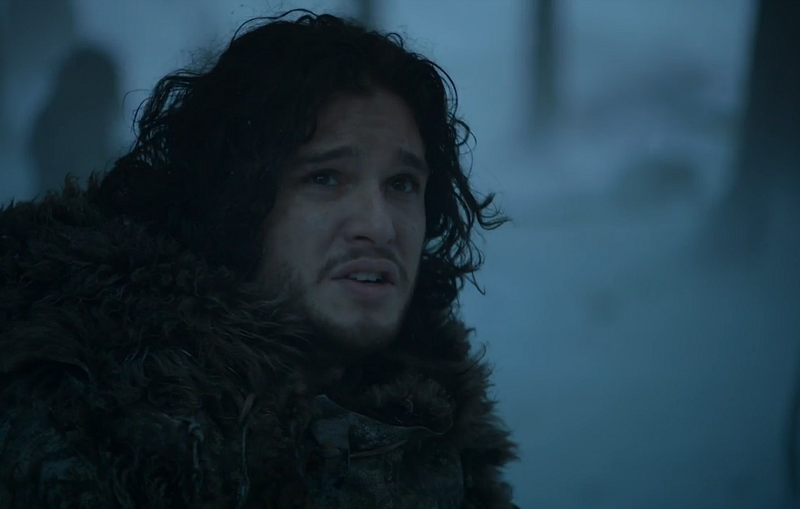 Further clouding Jon Snow’s fate are comments made by Game of Thrones author himself, George R.R. Martin. His “Oh you think he’s dead?” remarks have led many to believe the talk of Jon Snow’s death from the HBO camp is indeed simply misdirection. Either way, according to Inquisitr, fans of the books may get the chance to find out first as Martin has hinted that the long-awaited sixth book Winds of Winter may finally be complete.